The project aims to establish protected piped water supply to 56 rural with a population of 62 men, 61 women and 100 children, 38 families are below poverty line. Gram Vikas has developed a simple yet sustainable concept of gravity flow water supply that has successfully managed to provide continuous water supply in hundreds of remote hilly villages. In gravity flow, where ever possible water is tapped from a suitable sprong exists, Gram Vikas have developed a highly innovative solution of establishing a sanitary dug well. A slit is cut down one side of the well and a pipe is attached at the bottom. The slit is then blocked back up, and the entire well is lines with stones. Water then percolates into the well, where it is stored, and can then be transported to the village over head tank. The spring or well are at a higher altitude than the village, therefore the water is transported through pipes using principles of gravity from where it is again distributed through pipes to all families around the clock. To ensure the pipes are protected, they are dug deep into the ground. T. Lailai under Lailai Gram Panchayat has 56 households and is larger compared to the other three villages. This village became part of GV operation villages after seeing the effects of the MANTRA programme in the neighbouring villages. Till a year ago , one had to traverse two small hills to reach the village. 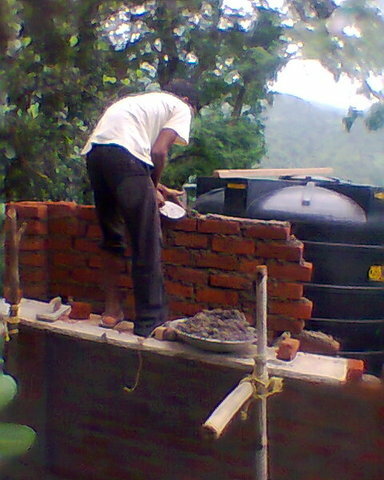 There was hardly any other development work taking place in the village. Presently under the PMGSY , a road has been made , making access easier than before. The people of T. Lailai approached GV staff to help initiate the programme. After some round of village meetings , the details of the sanitation programme was finalised, roles and responsibilities of the office members agreed upon and the physical work started. The entire community worked together and completed the sanitation infrastructure within 9 months. 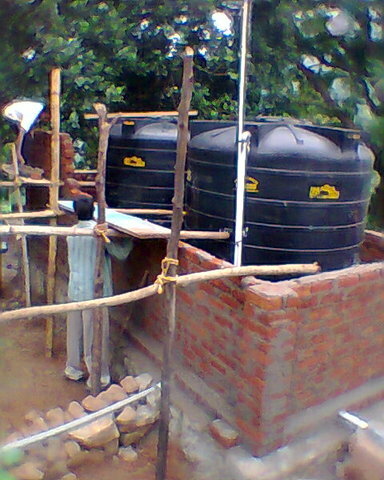 Thereafter the water source was selected and the plan was to have a gravity fed water supply system. A source was located close to the village, but it dried up in the ht summer. People made another source nearby which too did not yield enough water . It was difficult to get an appropriate site and other options like a borewell or dug well was also not feasbile. The community located a site in Taraling village boundary and after negotiating with the people of Taraling , the site was finalised was puchased by T. Lailai committee for Rs. 5000. This led to delay in the completing the water supply work. The design had to be changed, the distance of the pipeline increased now (It is a 3km stretch of pipeline) , the supplier did not have stock and we had to wait for the consignment. Finally after sorting out these issues, presently the work is nearing completion. Water and sanitation activities have been taken up as entry point activity for initiating all round development of villages. 100% inclusion of all families is a per-condition for initiating the WATSAN work in villages. This is crucial from a total sanitation point of view, as even if one family continues to practice open defecation, water sources will continue to be polluted. 100% inclusion is also a step towards addressing exclusionary practices prevailing in society; mainly towards dalits, indigenous communities and women. Before the programme begins in any village, the village must come to a consensus that all families, without exception, will participate. This brings the community together across barriers of caste, gender and economic status, which for centuries have excluded large sections of communities from the process of development. The village must also raise a corpus-fund of Rs 1,000 ($22) per household with the better-off paying more and the poorer less. The corpus fund is an acid test, demonstrating that the community is committed to the process if development. Interest from the corpus fund is used to meet the social costs of extending the water and sanitation system of new households in the future. ensuring 100% coverage at all times. The community drives the implementation of the programme. The community makes the bricks and collects all the local materials available and rural youth trained in masonry build the overhead water tank and lay the network of pipes. 1-2 rural youth are trained as pump operators and are taught how to make any necessary repairs to the system. The management of the project is undertaken by the Village Executive Committee (VEC) comprising of 6 men and 6 women, all of whom are elected in a democratic way. In addition to construction the water and sanitation infrastructure, Gram Vikas spend time building the capacities of this committee to enable them gradually take over the entire responsibility for managing the water and sanitation infrastructure after Gram Vikas' withdrawal from the village. Although the government is supposed to provide and secure drinking water to rural communities, most often it ends up by installation of a hand pump in the village. With high use, the pumps often break down and the community depends upon the government functionaries to repair the system. In many instances such delays linger for long and people resort to unsafe surface water for drinking purposes. Government usually priortises bigger villages for implementing of water supply projects and the small, hilly tribal habitations are left to fen for themselves. There is hardly any intervention in these small habitations that can help the people to get safe water. In this context Gram Vikas priortises its efforts in such remote areas and works with the community to have systems to manage their drinking water needs.